Even though Don is certainly not the man to easily give into peer pressure, I keep popping into this conversation to see if maybe all the interest in a new (and more importantly available to those who weren't around) LunaSol flashlight might get some traction. That definitely constitutes a Grail light. "So come on Don, all the cool kids are doing it..."
There certainly appears to be a significant and willing niche for the LunaSols that were the 1st custom lights to offer the 2 differing beam types in one light. I loved my LunaSol 27 and am sure that with the combination of XPL-HI and Yuji emitters, this would be a fantastic offering once again. Still finding time to take some photos Don? Seems it has been a while since you shared any with us. How was this years whale watching season? I would just like to thank Don for staying true to the hobby. Take one look at the various Facebook groups and they're awash with lights, if you pardon my ignorance, that look like reheated Mac EDC or Tri-EDC lights with niche materials chosen for style over substance, some (albeit nice) fancy machining detail on the surface, garish clips that look like they would snag every garment in a 5ft radius and a four-figure price tag. Don has stayed true to materials that are demonstrably good for flashlights, a function-driven form, clips that simply work and prices that have barely changed for as long as I have been on CPF. Thanks Mike Salt! David RZ, I posted some more whale shots. Don, so what's your own personal EDC light(s) these days? i.e. what exact LED, Converter/LightEngine, Head and Battery Pak are you carrying. Also how about for your keychain too. Lastly what make batteries are you using in these lights. Very curious about this and I figured your reply might help some of us with deciding on options. I'm stunned you don't run an Eneloop? That's just shocking to me. I would if I had one. I have a couple eneloop AA's but never got any AAA's. I love the shelf life of the Energizer lithiums. I have lost so many expensive tools to leaky alkalines that I keep a good stock of Lithium AA and AAA for tools and devices that may sit for months or longer between use. I just grab one of these once or twice a year for my Sapphire when I need it. I was a bit surprised to see that you were running a 14500 in a AA clicky pak. Is that because the mule head with the 123 clicky pak was too short for your hand? The 1xAA pak is better in my hand than the 1x123 and that was part of the motivation. I also clip the light on the outside of my shorts sometimes and the smaller diameter AA pak means I am a bit less likely to bump the light when maneuvering in tight quarters. There is not a real big difference but definitely when clipped inside my front pocket the smaller diameter makes it easier for my hand to get past the light and down to other treasures. I decided to give the 1xAA pak a try and found I preferred it. The 14500 and 13240 I use both are rated at 750 mAh so stored energy and run time should be the same. EDIT: I meant to type 16340 and not 13240?!? Last edited by McGizmo; 06-01-2018 at 01:14 PM. I feel the same way. I love the AA Pak on my Haiku. Very comfortable to use. That is what I want I'd the one AA pack for one of my Haiku heads, they look wonderful as well! Don I think your lights have always achieved the perfect blend of Function/form which to me is such a difficult thing to obtain but when you get there its amazing. You have achieved this in your lights. I truly don't understand how anyone could be asking for more than whats available? Think of the poor souls who own all of the McGizmo lights... What do they do now that there isn't another light to purchase? Haha. How about those who weren't around for some of Don's older light designs? The PD mules and the lunasol lights are both something I missed out on because I wasn't around CPF back then, but I sure do think they look to be wonderful light designs that I would love to be able to get my hands on. Although I do have to admit with the various heads, bodies, and emitter options, the McGizmo lights are wonderfully adaptable to various situations and use scenarios. their size (lumens) and the presence of memory in LE 6V? 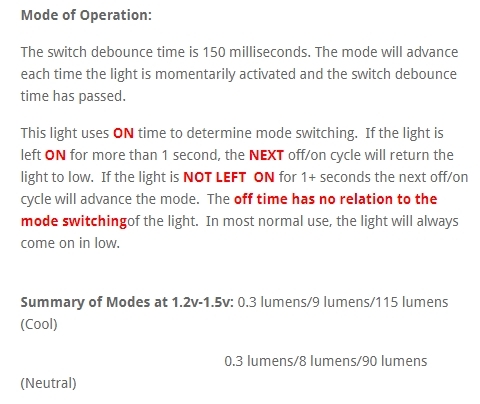 that is, how control is implemented, what brightness modes exist and other. and a flashlight control system. to know what levels of lumens give the driver 6B with diodes 119V and XM-L, but I can not find it. with the same question, but so far there is no answer. this does not always work, I apologize for this. Last edited by desert.snake; 06-08-2018 at 10:33 AM. Last edited by archimedes; 06-08-2018 at 01:35 PM. how do you go about ordering a torch? Love the design. Here you go with the ordering info and available lights! I see people are still asking for a new LunaSol. Can't say I blame them. The LS20 was the first McGizmo I bought, I still have my LS27, and I modded quite a few of them to have extra brightness modes. But I know Don doesn't want to dig up the obsolete (even if still cool) PD design that the Lunasol was based on. However, there's a different solution that could provide even better flexibility than the LunaSol design, if Don is willing to consider it: An aspheric light with an adjustable focus. It would require separate fore and aft sections of the head, both threaded to allow precise adjustment of the beam focus, and an additional O-ring outside the threads to keep water out, but those are hardly unique problems. It wouldn't be significantly longer than the Haiku either, since the space occupied by the aspheric lense would be comparable (or even somewhat less) than the space occupied by the Haiku's reflector. It would only be longer than the Haiku when the focus was adjusted to its tightest, throwiest position. And an adjustable aspheric head would be 100% compatible with the current design of McGizmo Clicky Paks. An adjustable aspheric light combined with a multi-brightness driver would be the most flexible McGizmo ever built, even more than the LunaSol, if Don could be persuaded to offer one. 100% agree. An aspheric is a natural way to completely decouple beam profile and brightness which is the main point. Although I love high end titanium lights and do not plan to sell my ls20, for my edc needs I had to take another road and heavily upgrade a mechanically decent 16350 zoomie. Never dared to suggest an aspheric to Don, though. I think aspheric lights are cool. I don’t have a Haiku yet but I will some day. I’m excited for anything new Don puts out too. Also ma tumba any chance you can share some pictures of that light? Last edited by staticx57; 06-23-2018 at 12:40 PM. The light engine has a Nichia 083 High CRI LED as the light source and this is the significant element. So why the name SunDrop? Well need some kind of name first and foremost. 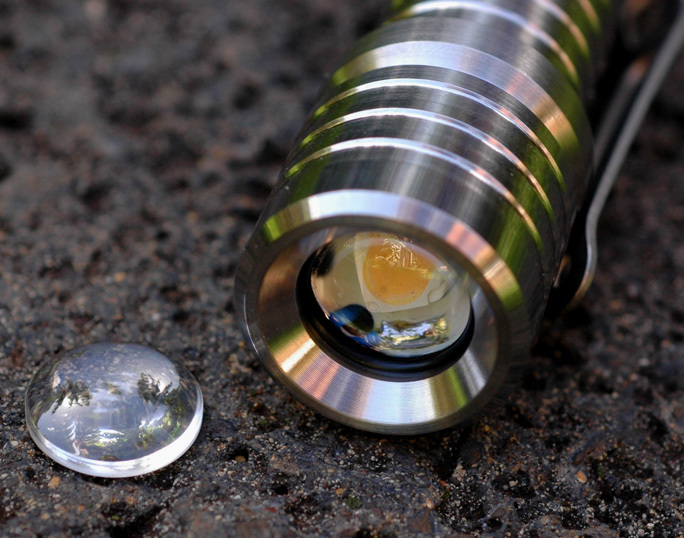 I designed a custom sapphire lens to aid in condensing the flood beam of the Nichia and the intent is to get a drop of sunlight on the target when the target can't be viewed under the sun itself. The lens itself looks like a drop and the name just seemed appropriate if not to ambitious. I don't think the design intent was "maximum lux" ... at least that is how I read it.